Power Point began its humble musical journey in the winter of ’75 aptly named, “Maiden Voyage.” The “Voyage” had taken the group into many a military enlisted men’s club, NCO and officer clubs, a Chinese restaurant and occasionally a few military open-air bars swarming with mosquitoes. The band’s first big break came at the C’est Si Bon and it was here that the name changed to Power Point. They moved to”Da Sting” and on to the Point After. Two months later, Saturday Night Fever opened in theaters and the Point After became standing room only seven nights a week. The Original members appearing this evening include; Alec Wong (lead singer), Jack Balauro (bass and vocals), Freddie Von Perez (drums), Bryan Aoyagi (guitar and vocals), and Jason Nagashima (keyboards). 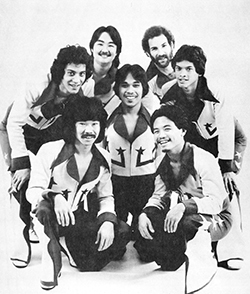 Filling in for missing members is Mark Yokoi (Mindless Groove – Los Angeles on vocals and keyboards)!